Manager Tommy Wright believes St Johnstone's success lies in continuity among the playing personnel. 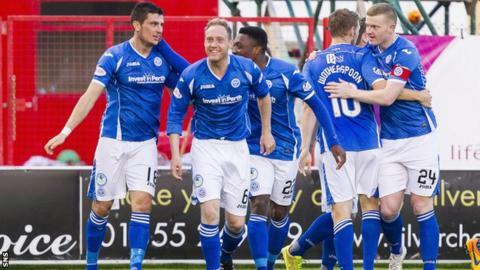 Saints have made the Premiership's top six in each of the past four seasons, lifting the Scottish Cup in 2014. "We do a lot of our work early in January, and re-signing players, we've been able to have a stable squad and one where you only need two or three players each season," said Wright. "We make sure in the summer we're not looking for six, seven, eight players." St Johnstone presently sit fourth in the league standings, hot on the heels of Hearts and Aberdeen in third and second respectively, after losing just once in their last 11 games. "We're only 17 games into the league campaign," cautioned Wright. "It's been successful so far but there's a long way to go. "There are 16 games to go until the split and we won't get too carried away. But we've put ourselves in a really good position this season. We're notoriously slow starters and we did have a pretty slow start to this season. "We've got to try to maintain the performances and pick up points; that will keep us at the right end of the table and keep putting pressure on Hearts and Aberdeen. "We've had a measure of success over the past few seasons but the level of consistency this year and quality in the final third have been excellent. That means that, at this stage of the season, it's the most points we've had." It is perhaps greater testament to the achievements of Wright and his team that they have routinely competed with, and out-placed, clubs with far greater financial clout. Ex-goalkeeper Wright says in spite of the constraints, the club is "run really professionally". "The market where we look for players is limited, because that's dictated by finances," he admitted. "I laugh sometimes when agents put players to me and I wonder what planet they're on; do they not know the size of the club? "I wont sign a player without meeting him at least two or three times, get a judge of his character, do checks on him with people we know in the game on what sort of person they are - they have to come in and be part of the squad. "I would like a match analyst and a sports scientist - I only have one person that does the two jobs. There's little things you'd like that you don't get. "Two years ago, our training pitch down the back, we had drains filled with sand because the weather was bad and the job didn't get done, but we had to train on it - none of the players turned their noses up at it, they just got on with it. "You see everyone's getting the GPS systems now - we don't have that; we can't afford it. We have other ways of monitoring the players. But that's the club, and I think because of the way it's run, it's an attraction to players as well - they know it's a stable club financially, and I think people do buy into it. "Some people think I'm a bit grumpy, but I'm not - I like the players to be coming in with a smile on their faces and going home with a smile on their faces."